Sagicho Festival. 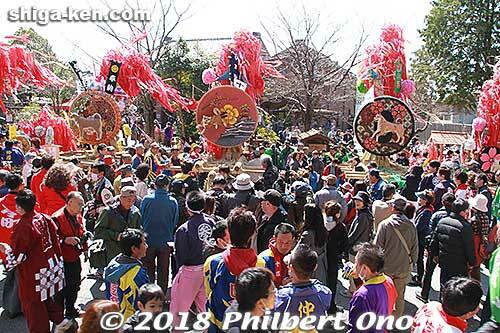 More Omi-Hachiman photos here. Omi-Hachiman (近江八幡市; also spelled Omihachiman) is a city in Shiga Prefecture on the east shore of Lake Biwa. A former castle town and merchant town with many remnants of its historical past, especially at Hachiman-bori canal at the foot of Mt. Hachiman-yama where the castle, built by Hideyoshi's nephew Hidetsugu, once stood. Locals just call the city "Hachiman" for short. On March 21, 2010, the city merged with the neighboring town of Azuchi which was reluctant to merge and lose its municipal and historic name. Omi-Hachiman is also a lake city fronting Lake Biwa as well as Lake Nishinoko where Suigo boat rides are a major attraction. In fact, this Suigo area of waterways and tall reeds has the distinction of being Japan's first "Important Cultural Scenery" (重要文化的景観). With all these attractions, Omi-Hachiman is quite tourist-oriented with tourist info offices in the train station and Hachiman-bori, as well as signs in English explaining the various sights. Another major attraction is the Azuchi Castle site, in the former Azuchi town. The Sagicho Matsuri festival held in mid-March is also one of Shiga's most famous festivals climaxing in the burning of floats. At least two other festivals also feature fire: The Hachiman Matsuri in April featuring giant torches set afire, and Shinoda Hanabi Fireworks in May. Kannon Shoji temple 観音正寺 - Atop Mt. Kinugasa near the Kannonji Castle ruins, this is the 32nd temple of the Saigoku (Western Japan) Pilgrimage circuit of 33 temples. According to legend, Prince Shotoku received help from a mermaid to build this temple. 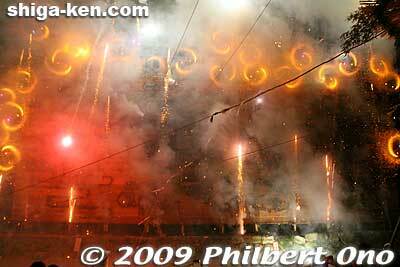 Unfortunately the temple caught fire in 1993 and and the important Kannon wooden statue was destroyed. The temple was rebuilt in 2004, and a new Kannon statue was made. Omi-Hachiman Station has a tourist info office as well as inside Hakuunkan at Hachiman-bori. Many shops, restaurants, and movie theaters are also around the station. The Hachiman-bori area is the main tourist area where you can easily walk to Shinmachi-dori to see the Omi merchant homes, take the ropeway up Mt. Hachiman-yama, walk around the canal, and enter museums and buildings. From Omi-Hachiman Station, take the bus and get off at Shinmachi. See the merchant homes, then walk to the canal area. Everything in the Hachiman-bori area closes at around 5 pm or 6 pm. If you need to eat, best to go back to Omi-Hachiman Station. Get on the JR Tokaido/Biwako Line and get off at Omi-Hachiman Station or Azuchi Station. Note that the kaisoku (or shin-kaisoku) express trains do not stop at Azuchi Station. You must take a local kaku-eki train. From Tokyo, 2.5 hours to Maibara Station via Tokaido shinkansen bullet train, 20 min. from Maibara to Omi-Hachiman Station. From Kyoto, 31 min. to Omi-Hachiman Station via JR Tokaido/Biwako Line. Omi-Hachiman Station (近江八幡駅) - Visit Hachiman-bori moat which is the historical part of town, and buildings by the American architect Vories. Bicycle rental at the station. Azuchi Station (安土駅) - The kaisoku (or shin-kaisoku) express trains do not stop at Azuchi Station. You must take a local kaku-eki train to Azuchi Station. Bicycle rental available near the station. Shinohara Station (篠原駅) - Bicycle rental at recreational grounds Imose no Sato (雪野山史跡広場妹背の里) (0748-57-1819) until 5 pm. Musa Station (武佐駅) - Former stage town on the Nakasendo Road. A few signs indicate where the Honjin and other buildings were, but none can be entered. 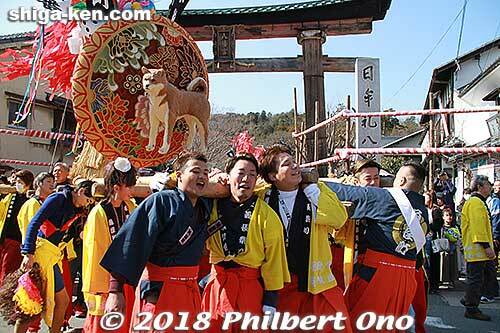 More photos at Omi-Hachiman Photos. More Shiga photos here. Click on the video image to start playing the video. Other sights in neighboring cities/towns within easy reach from Omi-Hachiman. Azuchi-cho - Location of Azuchi Castle ruins. Only one train stop from Omi-Hachiman Station. Ryuo-cho - By bus from Omi-Hachiman Station. Higashi-Omi - Easy to reach via Ohmi Railways to Yokaichi. 1579 - Azuchi Castle is completed by Oda Nobunaga after three years of construction. 1582 - Azuchi Castle is attacked by the forces of Akechi Mitsuhide. The castle is burnt to the ground. 1914 - Azuchi Station opens for trains. 1954 - The towns of Oiso and Azuchi merge to form Azuchi-cho town. 1993 - A fire destroys Kannonsho-ji Temple's main hall and a Kannon statue. 2004 - Kannonsho-ji Temple's main hall is rebuilt and completed. 1954 Omi-Hachiman established as a city. 2006 A small, but beloved and essential wooden bridge supported by two wooden boats over Hachiman-bori canal faces controversy as an illegal structure. 2010 On March 21, Omi-Hachiman and Azuchi town merge. A mayoral election for the new city is held in the following month. Many non-locals and tourists mispronounce Omi-Hachiman as "Omi-Yahata" or "Omi-Yawata" which are different ways of pronouncing the kanji characters. Local people in Shiga simply call it "Hachiman." The town of Azuchi since 1986 has been trying to find a folding screen with a painting of Azuchi Castle supposedly sent by Oda Nobunaga to Pope Gregorio XIII at the Vatican. In Nov. 2005, the town mayor was able to meet the Pope at the Vatican while showing what the folding screen might look like. The folding screen is yet to be found. The magnificent Azuchi Castle existed for only three years before it was burned to the ground. Since few records remain of the castle, the folding screen would shed much light on what the castle looked like. Next to Azuchi Station on the south side is a sumo ring. Nobunaga held a sumo match in the area and thus helped to develop sumo. Warlord who built Hachiman Castle. Native of Owari (now Aichi Prefecture), major warlord who sought to conquer and unify Japan. He needed to control Shiga since it was next to Kyoto and a major crossroad. He built a magnificent castle in Azuchi, and also torched many Buddhist temples such as Enryakuji in 1571 whose warring monks might have opposed him. The Azuchi-Momoyama Period of Japanese history is partially named after the castle in Azuchi. Assassinated in Kyoto by Akechi Mitsuhide. Native of Kansas who came to Omi-Hachiman in 1905 to teach English and do missionary work. Later he opened his own architectural firm and designed numerous Western-style buildings in Shiga, including Toyosato Primary School. Married a Japanese and became a naturalized Japanese citizen. His hometown of Leavenworth, Kansas and Omi-Hachiman are sister cities.